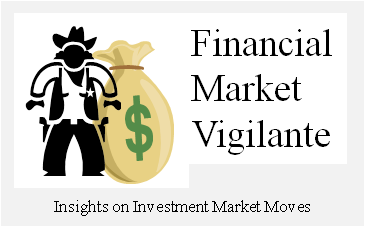 Financial Market Vigilante: Is “Secular Stagnation” causing poor U.S. economic performance? Is “Secular Stagnation” causing poor U.S. economic performance? The news headlines announced 1Q GDP growth of 0.2% on April 29, 2015. Anemic would be a compliment. Why isn’t the U.S. economic engine roaring ahead? There is a large tailwind of lower energy prices. The major market stock market indices recently reached new all-time highs (SPY) (DIA) (QQQ). Apple (AAPL) and Amazon (AMZN) stocks continue to grind to higher and higher plateaus. Why is the mainstream economy so “disconnected” from the stock market? And why is the cost of money on government debt so low in the U.S. (0 to .25% on short-term Treasuries) and even negative in the Eurozone. Secular stagnation is defined as an economic situation created when there is a chronic excess of saving over investment. The economic prescription proposed when this situation occurs is to expand fiscal policy in general and public investment in particular to promote growth. Is the chronic saving situation real or is it just a consequence of prior political actions which now need to be corrected? And if so, how did the U.S. and the world get into this predicament? Over the past 5 years, the U.S. government has kept spending growth well below historical averages since WWII. At the same time the interest burden on the national debt has also been reduced thanks to a large dose of QE from the Federal Reserve which has led to lower interest rates on U.S. Treasuries. Spending growth has been constrained since the very large increase approved in the 2009 Obama budget which triggered the U.S. debt burden to reach a much higher relative level of over 100% to GDP. Statistically the rate of increase in current government expenditures at 1.4% per year from 2010-1Q2015 is historically in the deflationary zone. In the 1st quarter of 2015 the spending rate continued to show relatively low growth, recording a year over year growth rate of 2.5%. This follows the 4th quarter of 2014 in which the growth rate spiked to 3.9% y-o-y for the first time since 2010. The current year $4T budget appears to lock in a continuation of historically low growth in government expenditures, with most of the burden for government economic stimulus being placed on the Fed monetary policy of low interest rates. How does Fiscal Policy affect GDP and Inflation? The rate of change in fiscal spending level is one of the most empirically traceable influences that the U.S. government has historically had on the financial markets. Regulation is also a big factor, but harder to trace quantitatively. The impact of government spending on the economy can be traced as a significant variable on the rate of change in both GDP growth and inflation through time, with the mix being a function of how the money is spent, economic circumstances and importantly the corresponding Fed policy. Historically, when the U.S. government spending rate has accelerated too fast relative to the size of the economy and the Federal Reserve has acted to monetize the spending rate, higher rates of inflation have resulted; likewise, in periods when spending has been constrained, most recently driven by the government decision to tax more and cut spending growth to rein in the national debt, consumer price increases slow and in some cases contract. Economic growth can also be curtailed in periods of government spending slowdowns unless private lending and investment spur growth. This scenario most aptly describes the current U.S. economy. As government spending growth has been flat in the past several years, lending growth has robustly rebounded and exceeded pre-2008 financial crisis levels with the exception of mortgage debt. As a result, the U.S. economy has grown at a low rate, and without inflation pressure. However, the current slowdown in growth in the midst of very high financial market liquidity and extremely low interest rates has led to the idea that the U.S. economy is suffering from secular stagnation. 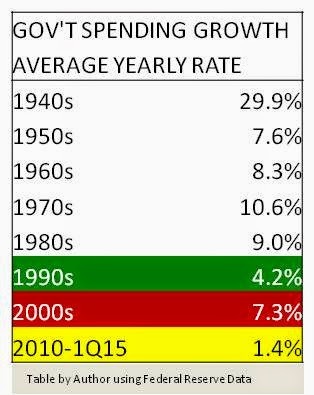 Contrast the current situation to the 1960’s and 70’s, a period known for stagflation. During that time, the size of the U.S. debt actually fell relative to GDP while still expanding in absolute terms. This situation resulted because the U.S. government over-rotated on taxing and spending policies - a dangerous concoction for politicians. When the Federal Reserve monetized the tax and spending policies in the 60’s and 70’s, inflation fireworks were lit. The current economic policy seems to be focused on avoiding this trap indefinitely through borrowing rather than taxing so that the political consequences are avoided. But, in the clever world of politics, it appears that the political desire to avoid policies that create unwanted “stagflation” has lead to a different economic illness that is called secular stagnation. Currently the Fed is attempting to back away from QE and the zero bound interest rate policies. However, Fed members continue to express concerns over lack of inflation in the U.S. and around the world. Fiscal policy in the U.S, at least in 2015, is more likely to trigger deflation than inflation currently. Lending growth continues, but the excess reserve level in the banking system remains near all-time highs even as the Fed balance sheet has leveled off at $4.5T since October of 2014. Prudent investments to absorb all of the excess reserves are not currently available in the financial market because Fed QE policy has conscripted government IOUs to its balance sheet to a degree that is much larger than ever before. From a simple review of supply and demand, the current economic situation would tend to support the secular stagnation thesis of “chronic excess of savings relative to available investments.” But where did this “excess of savings” originate and is it really “chronic?” One can argue that the excess liquidity in the financial system in 2015 is actually a function of the Fed QE program (as well as the BOJ and EU), not because the investing population suddenly decided to save not invest. Dollars saved always equal dollars invested, unless there is a monopolistic force that can create an extraordinary influence on the flow of funds. Only if you argue that the government is artificially rationing the supply of available investments to create a chronic over-supply of dollar liquidity does the secular stagnation logic actually hold. Quantitative easing in which the Fed buys and holds U.S. Treasuries and government MBS securities off the open market creates the illusion of excess savings. However, chronic means “never-ending” or “lasting”. For those with short memories, back in 2008 the issue was the opposite of the current financial situation. Financial institutions where heavily over-leveraged throughout the world. And then, triggered primarily by the Lehman Brothers bankruptcy (and the mortgage lending factors which led to that situation), the dollar liquidity in the system froze. Available investment alternatives were abundant, but savings in the system was nowhere to be found to make a market in the investments. Stock markets throughout the world suffered major corrections, and interest rates on debt instruments other than U.S. Treasury denominated securities fell in value as interest rates sky-rocketed. In fact, the Fed was selling U.S. Treasury assets from its balance sheet during the crisis, and odd action at a time when dollar liquidity seemed to be needed, not a removal of dollar liquidity. Excess savings in the U.S. financial system is very much a function of the politically dictated mix of fiscal and monetary policies. It can change suddenly. An 8 year presidential term does not meet the definition of chronic. The fatal flaw in the secular stagnation argument is that it is being driven, ironically, by government policies put in place by the representatives that want the power to increase government fiscal spending. The so called "excess savings" are a by-product of the massive Fed QE program combined with Dodd-Frank enforced capital requirements which forces banks to keep more liquidity in the system, unless of course it is invested in U.S. Treasuries. Unleash the excess reserves on government programs or public works projects, and the secular stagnation proponents will “save the day”. All that is needed to complete this political tri-vecta is an economic situation which needs to be remedied going into the 2016 election. Larry Summer’s argument about “secular stagnation” is just beginning to permeate the national discourse. It is a political strategy, not necessarily an economically sound proposition. But the timing of the argument is opportunistic. There are signs that the U.S. economy is weakening and the Fed is being pushed to remove its zero-bound interest rate program which will begin to make the financial “house of cards” more difficult to keep in tack. I expect the secular stagnation argument to get more attention as economic growth continues to disappoint, financial instability grows and the 2016 Presidential election draws nearer. The position that U.S. policymakers adopted in 2009 when Obama took office– that in a liquidity trap caused by a major banking crisis you need fiscal stimulus and QE to help the recovery – worked over the short-run. In fact, the combination of a heavy dose of fiscal policy expansion in 2009 and QE was sparking inflation by the end of 2010. However, fiscal spending growth was ratcheted down severely in 2011 and has remained virtually flat through 2015. When you factor in the low investment spending of state and local governments, the argument that government spending has over rotated toward austerity is now poised to gain traction heading into the 2016 election. On the flip-side, using QE to stoke economic demand hasn’t proved strong or reliable enough to negate the need for direct fiscal stimulus. QE as a policy tool is an appropriate means of keeping the markets liquid and stable. But short of unleashing the regulatory capital requirements so the excess bank reserves can chase even the most unsavory loans, excess reserves are trapped in safe investments or chased into liquidity pools created by Wall Street which appear to have the advantage of a quick exit path if needed. The result has been asset values bubbling higher and higher on a shrinking pool of suitable investment assets. This situation of ever increasing financial instability will continue until there is an arresting change. In my opinion, given the growing evidence of poor economic performance, the change point is drawing near. The change is increasingly likely to be marked by a re-set on the current fiscal and monetary policy mix. It is also very likely to be triggered by an international financial incident that gives U.S. politicians cover to make a change. An election may be needed to clarify the actual direction taken, which means there is likely to be a void in time in which uncertainty is much higher than it is today. Given the likelihood that future U.S. policy has reached a point of greater uncertainty, the current foundation of both lofty stock values and low interest rates is at risk. It is possible that changing the current policy can be positive for U.S. growth for a time period after an adjustment is made. However, it is unlikely in reviewing economic history that the path to change direction from the current path would come without a sizeable “correction” in the market valuation of financial assets. This prospect should keep investors increasingly wary for the foreseeable future.